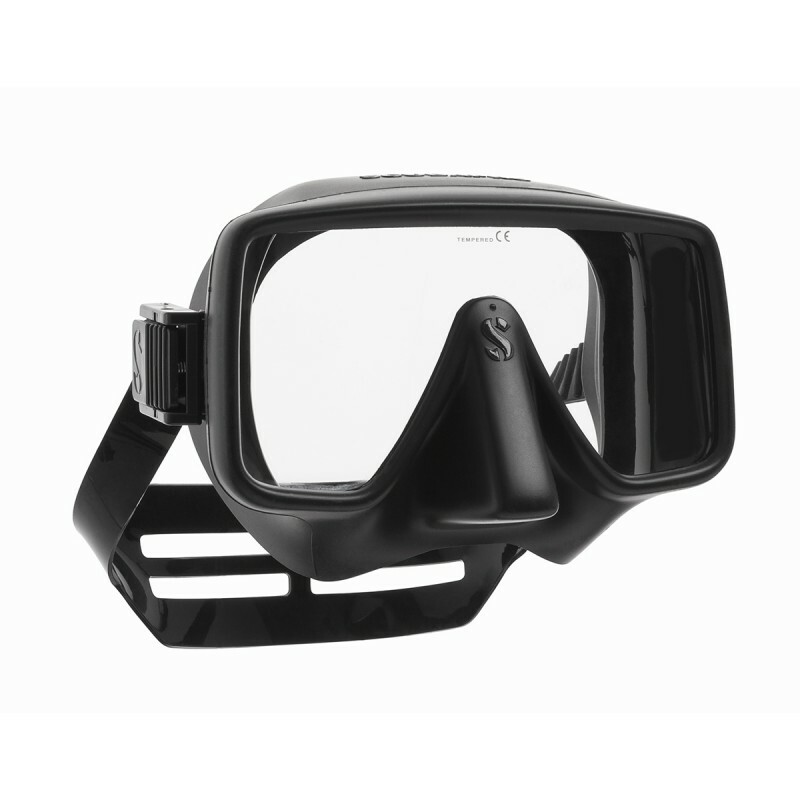 A SCUBAPRO CLASSIC SIZED LARGE Here's diving's first -- and still best -- frameless mask, specially designed for larger divers. Frameless masks are great because they're able to sit close to your eyes, providing a wider field of view, plus they offer less volume which makes it easier to clear. Also, since there is no frame, the buckles attach directly to the skirt. This enables the mask to fold relatively flat for packing or for slipping into a BC cargo pocket. SCUBAPRO's Frameless was the first frameless mask to hit the diving scene, and its been a hit since the beginning. However, larger divers sometimes had difficulty achieving the perfect fit. So SCUBAPRO engineers came out with the FRAMELESS GORILLA. 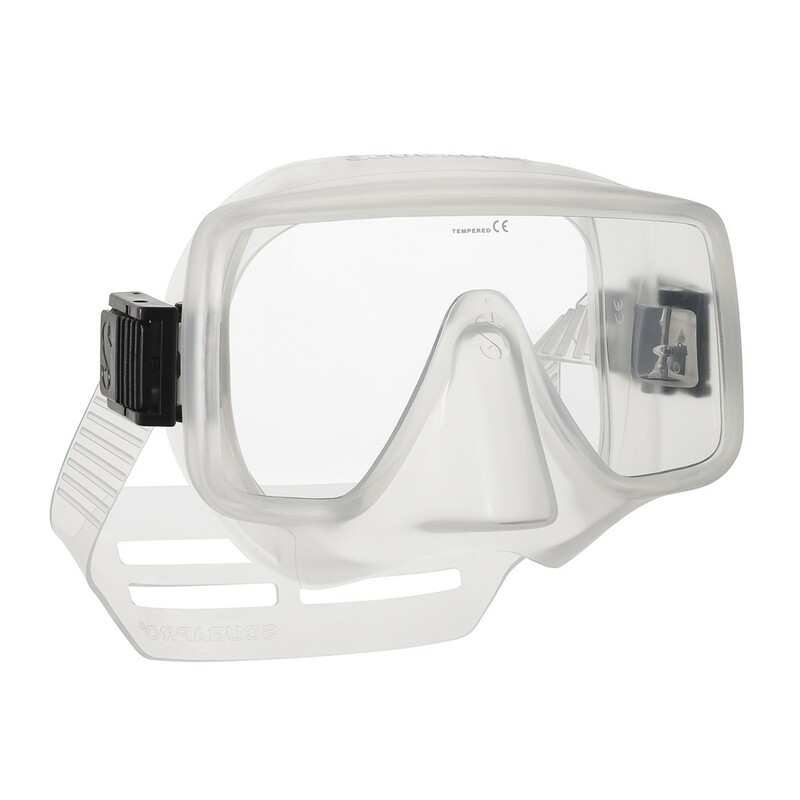 This stellar mask shares the same classic single lens design and long list of comfort and performance features as the original Frameless, but provides a slightly larger, wider lens and a slightly larger skirt in a matte finish for divers with larger or wider faces. Like on the original Frameless, the soft silicone skirt on the FRAMELESS GORILLA is comfortable yet durable, and the double-edge seal feels good against the skin. The push-button buckle system is easy to use and allows for quick adjustments. Buckles attach to flexible tabs on the skirt; this optimizes strap angle when dialing in fit. The wide headband spreads the load on the back of the head, greatly enhancing comfort. You have only to try one on to understand why the FRAMELESS GORILLA ranks as the premiere frameless mask among big divers, both professional and recreational, the world over. • Traditional buckles attach to the skirt, enabling the mask to be folded flat for traveling. • Wide headband allows for a comfortable fit against the back of the head.